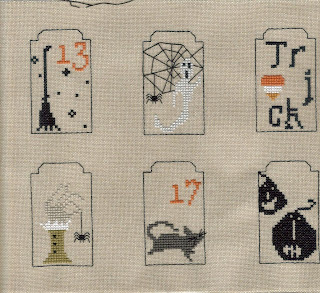 The theme for September on the Hallowe'en blog was Black Cats, there were so many different Black Cats to choose from this month it really was difficult to pick just one. I searched through all my downloaded charts and my JCS issues, paper and digital and finally decided on this companion piece to Boo who is our logo this year. The design is by Val's Stuff and comes from JCS Sept/Oct 2009. I don't know too much about Val but she does cute designs. 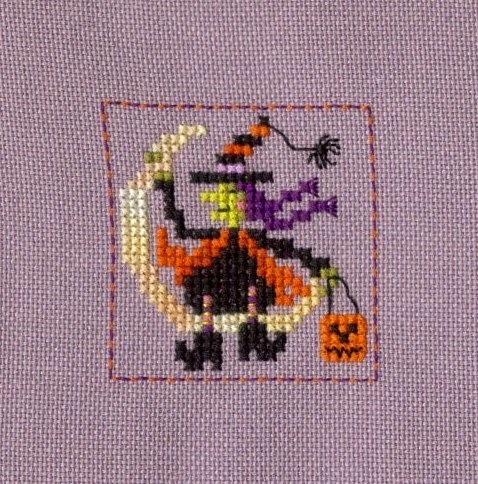 I stitched this on the same 32count evenweave as Boo and changed the border colours to co-ordinate with Boo too. I found the perfect button for the star but couldn't find a blue moon so I made a beaded moon instead. I've been haunting the local craft shop for finishing bits and pieces and now have almost everything I need. I got the tree down from the loft and tomorrow I will be making 30 tombstone markers and a coffin container for them all. Show and Tell to follow! I have got one more over 1 leaf to go on that mistletoe which seems to have taken forever! To be fair I have been working on that one section since 20th August. Once that is finished we are on the home straight with just some letters and one more snowflake. Hopefully in time for Christmas. Next month's theme is a particularly exciting one for me, chosen by a special Guest themer, pop over to this post to find out what and who! Finally, I am having an impromptu Blog Hop to celebrate my 500 Followers, all details on the previous post. Unfortunately Zeb is no longer updating the SAL on her blog but that's no reason to stop stitching and posting! So here is my monthly update. I stitched these on 32 count lavender evenweave using the DMC conversion provided. 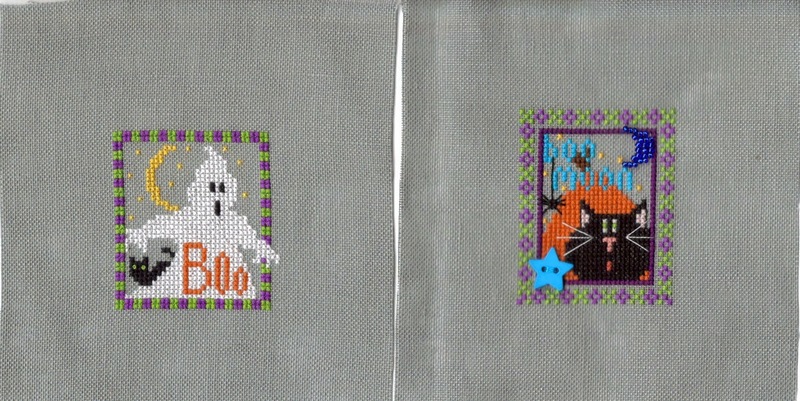 I changed the moons to DMC 4090 one of the variegated threads and also made the borders stripy. Having stitched them all on one piece I am now undecided as to whether to frame them in a long thin frame (which I don't have and haven't seen) or whether to scrap book them individually on one page. 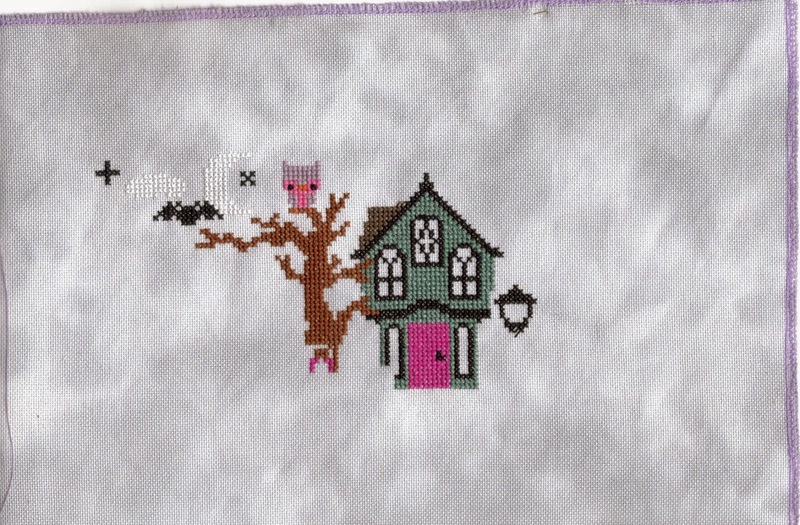 I'm a bit of a fan of Mr. X Stitch and his blog, there's often something unusual and alternative going on. This post is a Battle of the Needles between stitching and knitting. Which will win? As I mentioned in the last post I have reached a rather big milestone; 500 followers. I had thought of doing a giveaway to celebrate but to be absolutely honest I still have two giveaway prizes to sort out from earlier this year and I don't want to be still working on 2014's giveaways in 2015! So I had a little think and thought about a Surprise Blog Hop. Very simple to take part, just leave a comment on this post making sure I can find your email address and your blog address from your profile. Next weekend I will email you the name of another participant and you must create a blog post dedicated to that person. 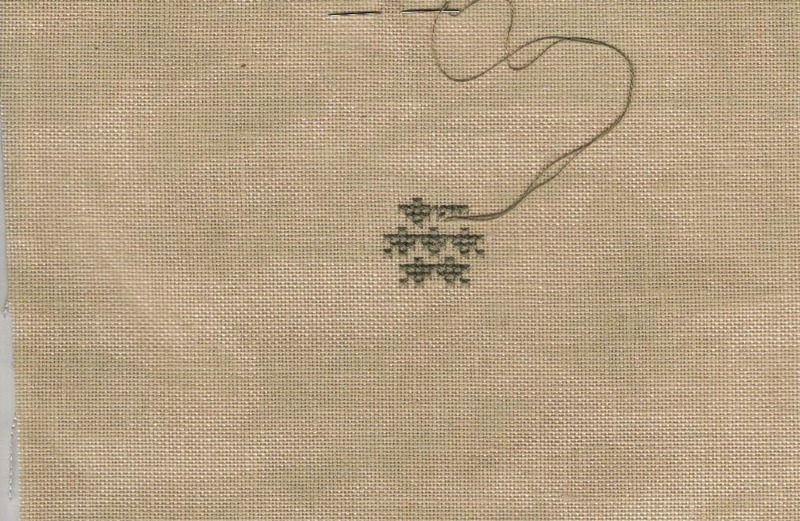 Read her/his blog and find out what they like and post any stitched pictures you might have that you think they might appreciate. Maybe find an online cartoon or a link to something they love. Anything you want really. I will list all the blogs here and we can hop around to see who had dedicated a post to whom. So not a giveaway in the physical sense but you will receive some thoughtfulness, some comments and hopefully a few new followers yourself. What have I been stitching this week? 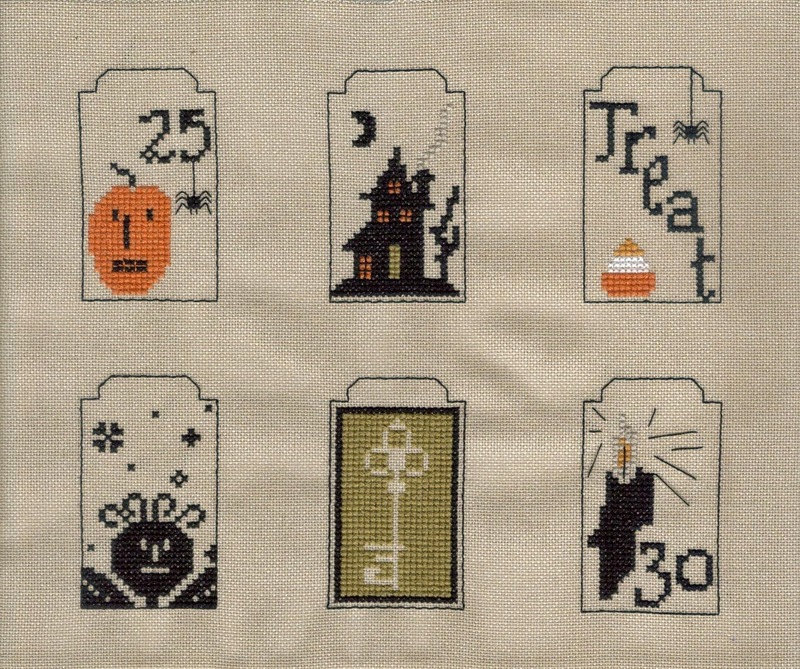 I completed The Little Stitcher piece for the TUSAL and was torn between the latest part of the Joan Elliott Faces SAL and the Frosted Pumpkin SAL. Then I remembered I have to rechart the skin for the JE design and that tipped the balance for the FP Hallowe'en Not-a-Mystery Town anymore SAL. The fabric is 28 count Moondust by Crafty Kitten and I am using the DMC conversion. I am very happy with the house colour, I blended 501 and 503 to make it a little bit more varied than plain 503. I must order some more fabric from Crafty Kitten, you get a discount code in your Birthday Month and mine is nearly over! Finally, I have been coerced into signing up for the DUCJC2015 (Debbie's Ultimate Crazy January Challenge) in honour of the recently departed Debbie. I have made a list of 27 designs I want to stitch on during January with the remaining four spaces put aside for new additions over the next three months or maybe unfinished projects from this year! Who else finds it fun just going through your list of designs and piles of charts? So many are gifts from friends so they come with little notes and letters to re-read too. 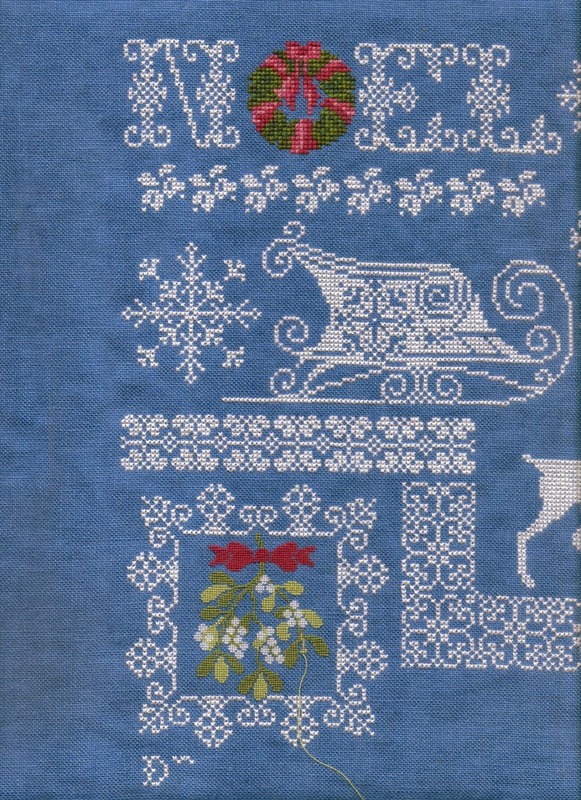 This year I am intending to stitch The Little Stitcher's Twelve Days of Christmas as a monthly project. Laura has designed twelve charts with a different theme for each one to represent the days of Christmas. She has invented the different themes herself using her lovely imagination! The Moon Riders I shall save for my Just Nan SAL post. 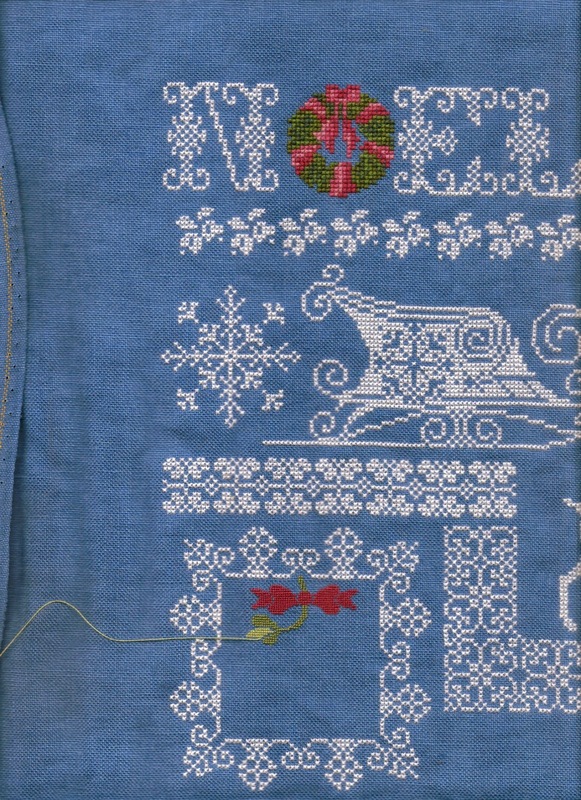 There are a few more white stitches to go under the straight line across the bottom. This one has slightly different proportions to the others so far, being wider but not so tall. So what shall we say on the subject of playing? Play - (verb) engage in activity for enjoyment and recreation rather than a serious or practical purpose. That seems to sum up cross stitching perfectly to me! Most of us started this hobby as a form of relaxation and an outlet for our creativity. It is difficult to earn a living through the hobby (unless your name is Nora Corbett, Joan Elliott or one of the big names in the hobby) because of the hours you have to put in to create a stitched piece. I know a few people who model stitch and some of them say it does burn you out after a while, always stitching for commissions. I even feel that way about too much obligation stitching. I love my Round Robins but there has been the odd band that just hasn't been fun to stitch! This next piece was emphatically NOT one of those. I did the bulk of this in just two days it was so much fun. Not technically a sampler with bands but very lovely nonetheless! Each one of us chose a different month to stitch. My birth month was already stitched so I chose February which is the Small Boy's birth month and charted with a lovely shade of deep red. Kathy's square has lighthouses which are one of her favourite designs to stitch along with nutcrackers. Finally, I took a little look at my followers, over the 500 mark!! Interestingly, 3 out of the last 7 new people are called Cathy! If you are a new follower and haven't left a comment yet, please do so, along with a link to your own blog if you have one. 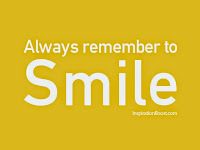 I do like to return the following. I promised a giveaway when we reached this landmark so I will have to have a little think about this one. Gosh, that list is getting long! Since this is my Birthday month I have added in all the Birthday money I received from my Mum, my Mother-in-law and both my Sisters-in-law. I still need to buy some fabric from Crafty Kitten and subscribe to CS&N the American magazine. I am cancelling my subscription to Cross Stitch Collection because of the dreadful paper they have switched to this month in an effort to save money. I am also considering cancelling World of Cross Stitching too because of the nearly 20% hike in subscription fees. I really don't need to keep getting all these magazines! Close-up of the very slow over one progress! This was my project during my holiday. Please could you also click on the Google Join This Site button just above all the smiling faces to the right of my blog? This button is how I count my Followers and return the following if they have a blog. Margie brought this to my attention, she follows me via Feedly and said she hoped I had a way of verifying that. Unfortunately Feedly doesn't have any way of finding out who your lovely followers are. So please show yourselves by using the button! It means I can find your blog and also, only 1 more followers will trigger a 500 Followers Giveaway. Only people listed under my Followers will be eligible for the Giveaway. 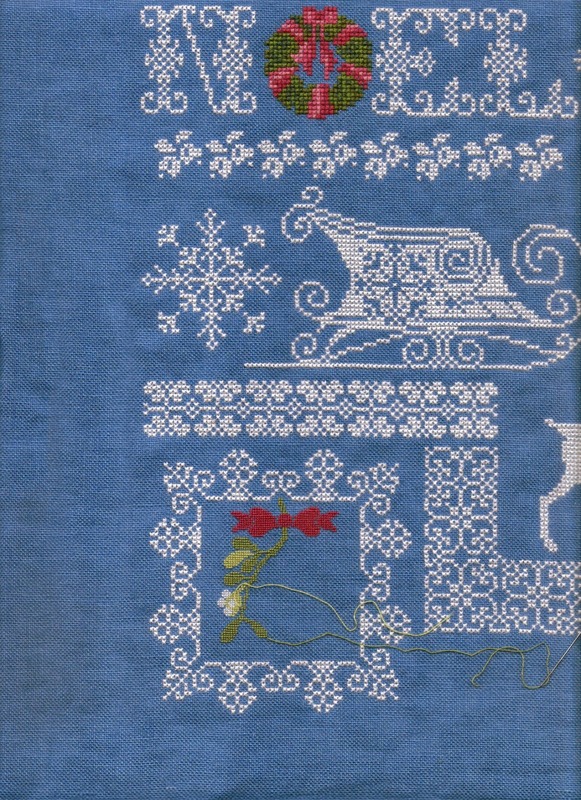 There were several entries for my giveaway to win a signed copy of the Cross Stitch Collection magazine which featured the interview with Yours Truly. It was very intesting to see which designs you chose as your favourites from the magazine. There were six different designs which people liked with the birds being the leader with five votes. NB if you want to win one of my giveaways it does help to read the instructions! I always make people earn their prize by asking a question of some sort LOL. Anyway, I allocated each entrant a playing card and then picked one at random. Ewa was the Ace of Diamonds and has won the magazine. That's great because she is getting married soon so now I don't have to buy her a present. Joking! 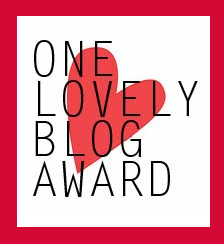 * Nominate bloggers you admire. * Contact your chosen bloggers to let them know. So, number one has been done; Thanks Margaret! 7 Things - I have been pondering The Seven Ages of Women recently as my Birthday is approaching and I have a special one in two years. 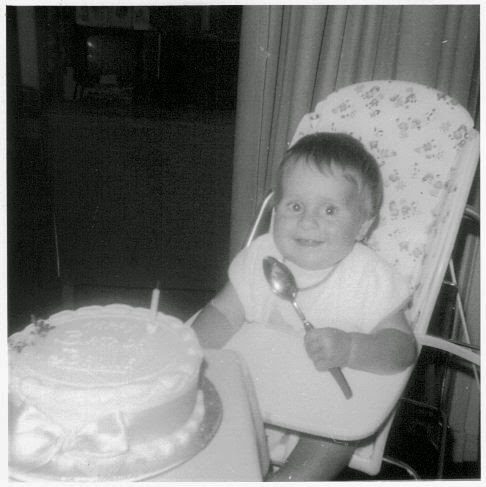 Child - I continued to be an adorable happy child although I did lose the chubbiness! My first experience of stitching came in Year 2 at school when I made a binca mat for my mother. Our rock club had saved all their half-pennies to raise money. That is my pint on the table next to me!! Working Woman - this was when I rediscovered cross stitch and started the hobby which has been part of my life for 21 years now. I commuted to work by train every day for 17 years and either read or cross stitched every one of them. We had a great group of friends on the train, several weddings and a few babies (not on the actual train thankfully!). I am still in contact with several of them too. Mother - That landmark occured nearly 12 years ago now. In fact exactly 12 years ago I was having alot of fun going into shops to buy baby clothes and telling them I was overdue by a week. hahaha. You get served very quickly. My stitching has fallen and risen with each child. Now they are both older I am able to squeeze more stitching in especially when they are both at school. Prime of Life - I am looking forward to this one! This will be once my boys are both more independent and I am able to dedicate more time to myself and my hobbies. At the moment I cannot leave the younger one overnight so retreats are out of the question. But one day! Grandmother - I am going to be an awesome Grandma! 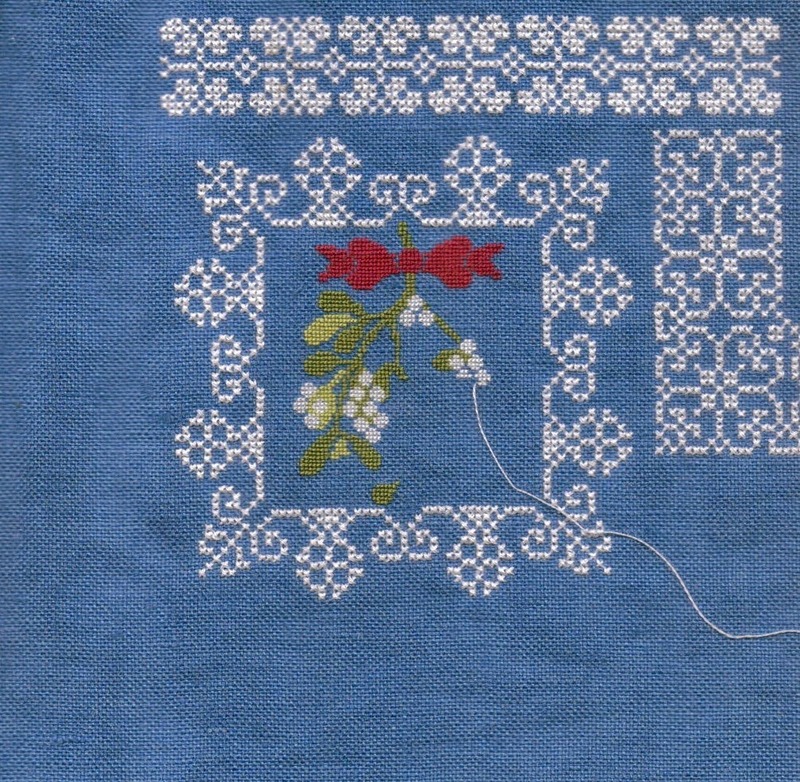 I have been reading lots of blogs written by Grandma stitchers and it all sounds like so much fun. I just hope my son does not make me wait for grandchildren for as long as I made my parents wait. Or I will be 72! I am definitely going to be like the Old Woman Who Will Wear Purple and I'm going to join societies, lots of them so I have can coffee and biscuits out every day! I will probably start de-stashing about this time too, so make sure you are still following me to score some bargains! So that's seven facts about me. Now to the next bit which is to nominate somone. I have done a few of these in the past so I will nominate some different this time. Someone who is a new but very regular blogger, who is always cheerful and has lots of crafting going on, someone who does have her personal struggles with her own health and her husband's but somehow always has lots of fun whatever she does with her gorgeous daughter in tow. Whether it's a day out in the city or a trip to Ikea you can be sure there will be photos galore (including some selfies) and plenty of happiness. Here's a button from her blog. Click on it to visit her and say Hi from me! And on Sunday I started Kathy's RR piece. She has chosen some San Man blackwork months for her sampler. September (my birth month) was already stitched so I went for February (the Small Boy's birth month). This is a rather quick stitch, it's so addictive! 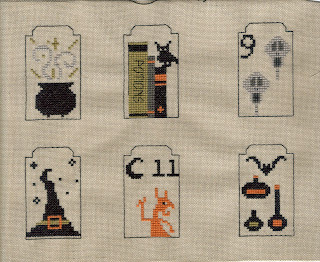 This is a really poor quality scanned picture, white never comes out well on the scanner but it gives you the idea of how much I did in just one day! So please show yourselves by using the button! It means I can find your blog and also, another 7 followers will trigger a 500 Followers Giveaway. Only people listed under my Followers will be eligible for the Giveaway. September WIPocalypse Who Do You Stitch For? Having completed all the blocks I decided to make a start on the header which I have now completed! To make it smaller I decided to stitch it over 1 on the same 32count fabric. I did the stripy border over 2 because it was so much quicker that way! There has been slow progress on this one because the design in the bottom left border is all over 1. Got loads of this done on holiday because there was poor internet! 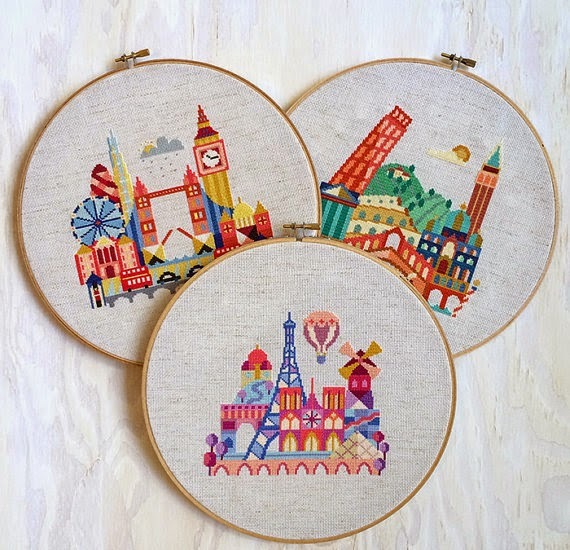 Who is your favourite person to stitch for, or do you prefer to keep your stitching yourself? I haven't done a countup of all 429 finished pieces on my Happy Dance blog but I suspect it would come out as roughly 50/50. My older son has the most pieces of any individual person but I have also stitched a lot of wedding samplers and baby samplers. I have a slight preference for baby samplers as the recipients tend to stay together and not get divorced two years later! There was once a custody battle over a baby sampler I did. The father was a friend of my husband and I stitched a sampler for his new baby. When he left the mother shortly afterwards she phoned us very upset because he had taken the baby sampler with him! So my husband phoned him and told him in no uncertain terms that the stitching stayed with the baby. I have stitched for teachers each year and support workers for my younger son. Now I have a blog I stitch for other stitchers which is both rewarding and nerve-wracking! According to my Happy Dance blog I have also stitched on 29 Round Robin pieces with five more to be added when they are completed. Out of the pieces I have kept for myself, the majority are framed and on the walls somewhere in the house. I do rotate my display pieces seasonally. I also scrapbook alot of the smaller pieces and display one of those per month. Margie brought this to my attention last post, she follows me via Feedly and said she hoped I had a way of verifying that. Unfortunately Feedly doesn't have any way of finding out who your lovely followers are. So please show yourselves by using the button! It means I can find your blog and also, another 12 followers will trigger a 500 Followers Giveaway. Only people listed under my Followers will be eligible for the Giveaway. So please show yourselves by using the button! It means I can find your blog and also, another 15 followers will trigger a 500 Followers Giveaway. Only people listed under my Followers will be eligible for the Giveaway. 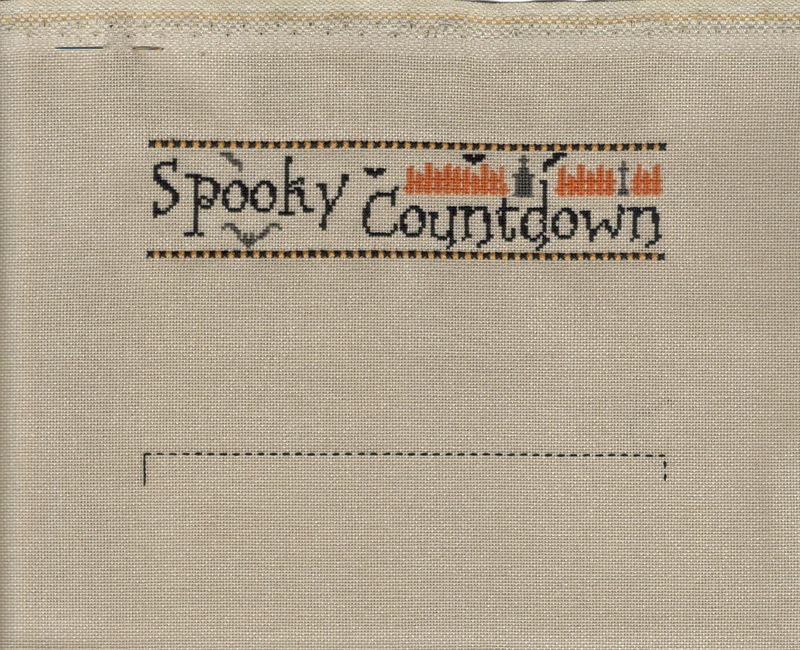 Now I have the header and footer to stitch, mount the blocks onto little gravestone markers and I will be all ready to count down from the 1st October. How long does it take to attach a leaf charm to a design? 10 months! I completed this design Oh Glorious Fall on 3rd November 2013, all bar the leaf charm which I finally attached this afternoon. And framed it so it is up on the wall next to Just Nan's Autumn Typography. Linda Stitchin' with my Furbabies is organising this in memory of SoCal Debbie who passed away recently. Thankfully Linda is not making us attempt the SDUCJC (Super Duper Ultimate Crazy January Challenge) or 60 starts throughout January and February which she did with Debbie in 2012. Please feel free to join us! Win a Signed Magazine, Autographed by a Famous Person! I was contacted by a very nice journalist called Rachael who sent me some questions and asked for photos of me and my work. The questions were easy enough, the standard questions which do the rounds of the blogosphere regularly; choosing photos of my work was harder - which pieces should I show? Heather had already shown her Teresa Wenztler Dragon! But choosing the photo of me was terrible! 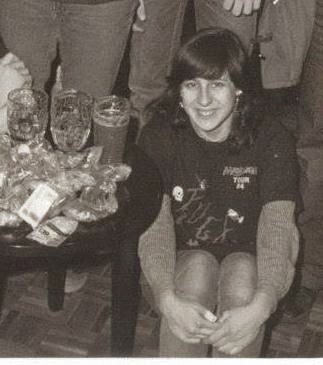 I just do not have any decent recent pictures and the older pre-digital were not high definition enough for the magazine to use. We went back and forth and the Large Boy took endless photos of me in different lights and places until we got the least bad one which is in the article. I’m a stitcher from the far east of England, married with two boys in Primary School. I work as a bookseller and also run a Baby & Toddler Group as well as being part of the School PTA and the local NAS group. I’d love to belong to a stitching group and would like to set one up in my town if only I had more time! How/when did you fall in love with cross stitching? Like many people, I made a Binca mat at school which I gave to my parents. 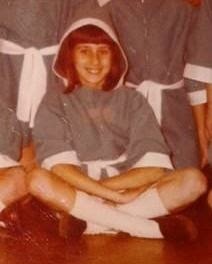 My Mum was a keen needleworker, cross stitch, tapestry and dress-making too. However I didn’t really discover my love until I was an adult. 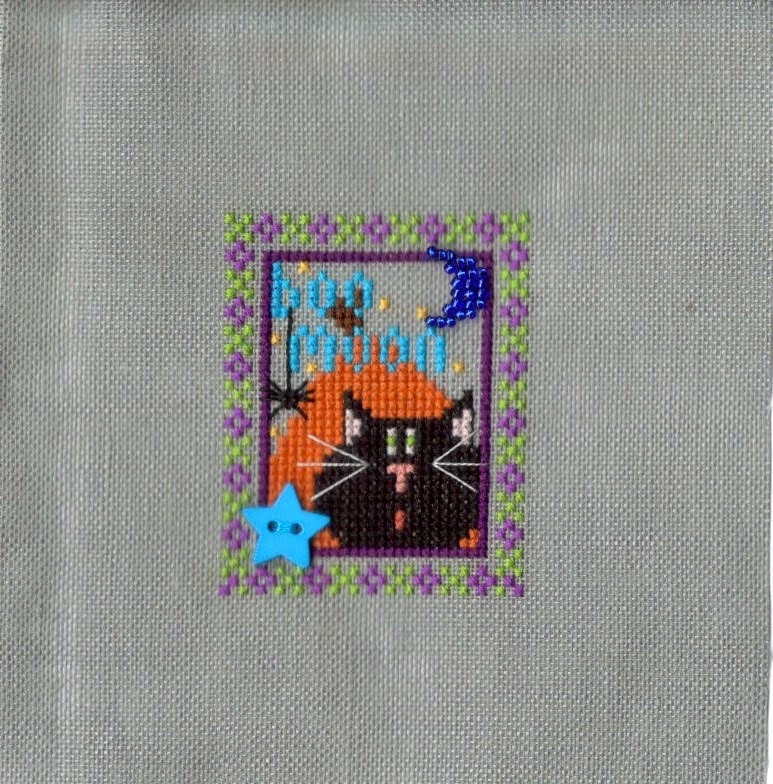 In 1993 I saw a friend stitching a Country Companions design and although the subject matter didn’t appeal I was rather impressed with the idea of making a picture onto a piece of plain fabric. The local department store had a haberdashery section with some kits and I chose two small Anchor sampler kits to make. They hooked me on the hobby straight away and I started to find out what else I could stitch. My next project was on black aida and the one after that was a gorgeous Chinese Dragon which used gold metallic thread. You can see I dived straight in at the deep end! What's your biggest stitching disaster or biggest challenge? Apart from the occasional attack of the frogs (where you make a mistake and have to “rip-it, rip-it, rip-it” out) I have not had any major disasters. I do enjoy a challenge, I love stitching over 1 on 28 count evenweave or higher counts, I like the more delicate effect this gives. I like to design my own samplers too. The one area I do find difficult is “finishing”, ie making the stitching into something. I have learned a lot of useful techniques from my fellow bloggers who post tutorials online. Probably the most challenging finish is Drac in a Box by Acorn House Designs. 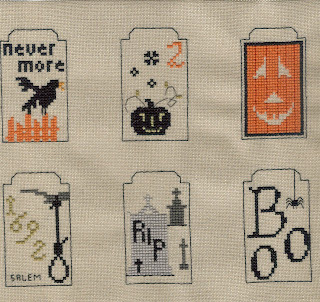 My friend Sharon from Shebafudge blog challenged me to stitch this one with her so we could learn the techniques together. The box itself was easier than I thought but the little figure was a challenge! On the way we made friends with Susan the designer who cheered us on to completion. Do you have a particular piece you're most proud of/is particularly special? I was stitching a Lavender and Lace design called Angelica when my Nana passed away so that one will always have a place on my wall. 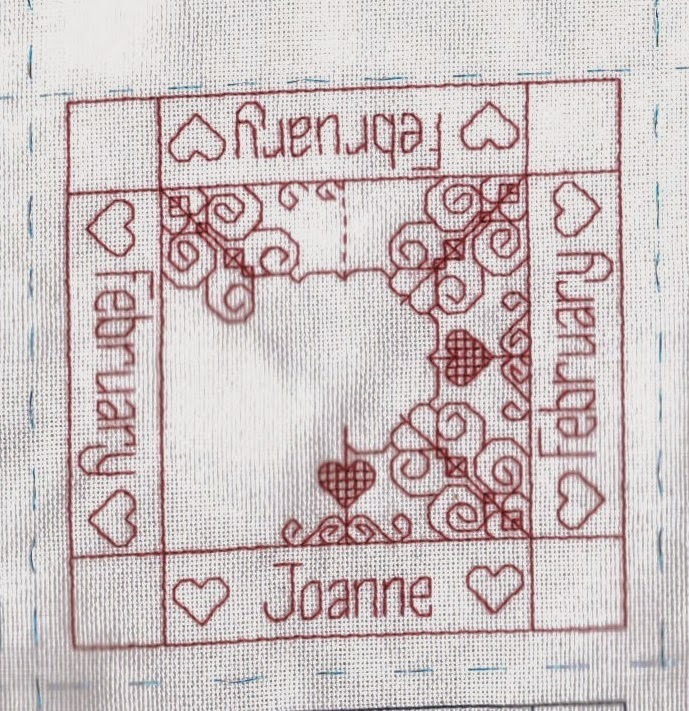 The most special pieces are ones I no longer have, because I love to stitch Birth and Wedding samplers. I love to find a suitable design for the family and amend it to personalise it and make it perfect for them. I also like to change designs to make them unique. The Joan Elliott Christmas Angel I adapted to fit into a multi-frame is one which has featured in your magazine and also received a comment from Joan herself on Facebook. It is an amazing feeling when the designers comment on your work and they like what you have done. What's your advice for stitchers with lots of WIPS? Stitch what makes you happy. Some people like a strict rotation, others are happier OAAT (one at a time). My current rotation is 3 small challenges per month, one sampler I stitch one length of thread each day and one larger project, usually an obligation piece for a wedding, birth or round robin. This way I always have a choice of projects so I don’t get bored with the same one. I also have regular finishes to encourage me while still making steady progress on the large sampler. So I could join in with the TUSAL! Regular bloggers will already know that the Totally Useless Stitch A Long is where we save the ends of our thread into a jar each and post a photo each month, just for fun and to connect with other stitchers. But seriously, I wanted to talk about my projects and share information with other stitchers in a way that you can’t on forums or FB. I belonged to three forums and noticed people had links in their signatures to their blog. I started to “follow” a few of these and very soon wanted my own. I now have my main blog and my Happy Dance blog which is a chronological record of every single piece I have stitched (currently over 400 pieces!). I also run some group blogs which are a great way to connect with people. What sort of things do you most like to stitch? 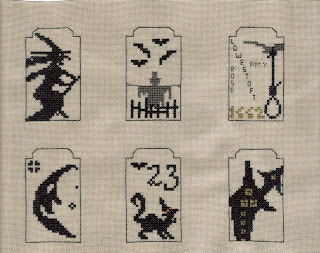 My top two types of stitching would have to be Fantasy designs and samplers. I love traditional samplers especially learning about the history behind them. Earlier this year some of the Scarlet Letter bloggers had a vist to the V&A museum in London for a private viewing of their sampler collection. It was incredibly inspiring. I love the fantasy designs by Nora Corbett, Joan Elliott and Teresa Wenztler too. 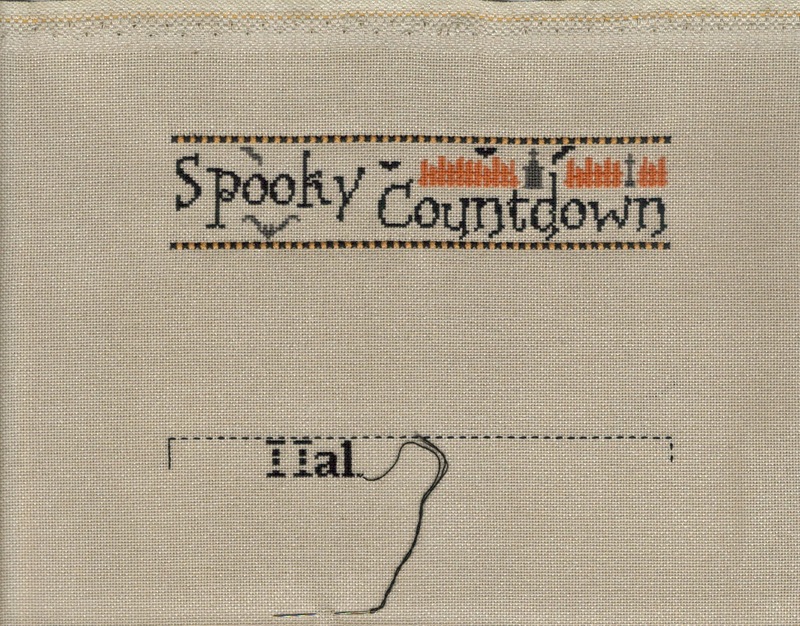 Since discovering the online world I also have discovered a whole world of Hallowe’en stitching and run a Hallowe’en group blog too. 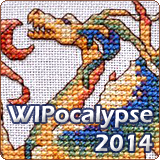 But if I was forced to choose just one topic to stitch for the rest of my life it would have to be Dragons! One of the most popular features of my blog is the regular Blog Hops. 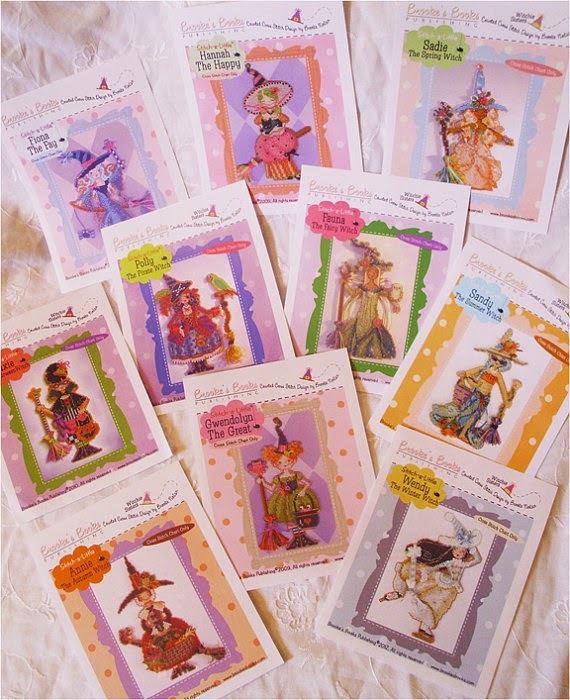 I host five a year; Valentine’s Secret Stitching Sweetheart, Easter Treasure Hunt, Summer Postcard, Hallowe’en Treasure Hunt and the Advent Calendar. Each one is slightly different but the end result involves hopping round lots of different blogs all posting on the same theme. It’s a great way to discover new blogs and learn a bit more about people you already follow. At the moment we are sending photos of our stitching on a Garden theme for the Summer Postcard Hop. I also like to discover and promote less well-known designers. As well as the Big Three named above, I am a huge fan of The Little Stitcher, Snowflower Diaries and Primitive Hare, all of whom feature heavily in my current collection of WIPs. You have until 10th September to leave a comment. Make sure I can contact you, if you are "no-reply" then email me with your email after you have left your comment. Obviously you have to be a follower in order to be a loyal follower LOL. Finally, the Summer Postcard Blog Hop is now completed! Sixteen postcards were sent out to fifteen bloggers because I sent mine to Krista as well as the one from Astrid. We both had visited and stitched Clovelly in Devon. I hope you have all enjoyed hopping around the blogs this summer. The links all go to the exact post so please do visit if you have missed any. 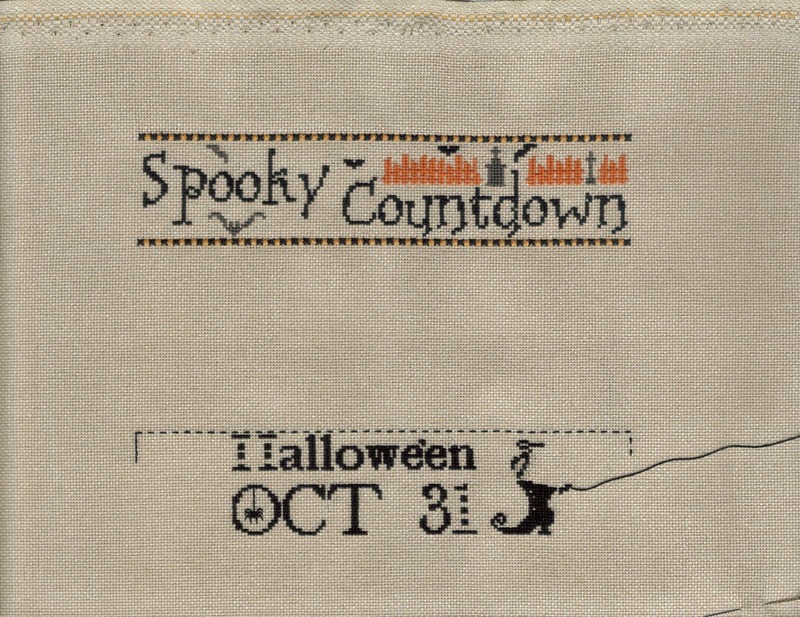 I have a theme for next year already and I'm also thinking about the Hallowe'en Trick or Treat Hop, sign-ups coming soon.